– Trials Rising Sixty-Six – Expansion I: Cruise and crash along Route 66 to experience the splendor that is the Land of Opportunity with new tracks and new Contracts. Taking inspiration from one of America’s favorite pastimes, football, this DLC includes items such as a football helmet, shirt, pants and cleats so players can cross the finish line in a sporty fashion. – Trials Rising Crash and Sunburn – Expansion II: Go below the equator to see the wonders of the Southern Hemisphere. Ride your way through the epic jungle-covered mountains of Peru to the icy region of Antarctica with two new bikes that introduce new gameplay possibilities, challenges and an explorer-themed outfit. – Samurai Pack: Slash through the tracks with the spirits of ancient samurai to guide you, with customization items that will allow players to stand out even more on the tracks. 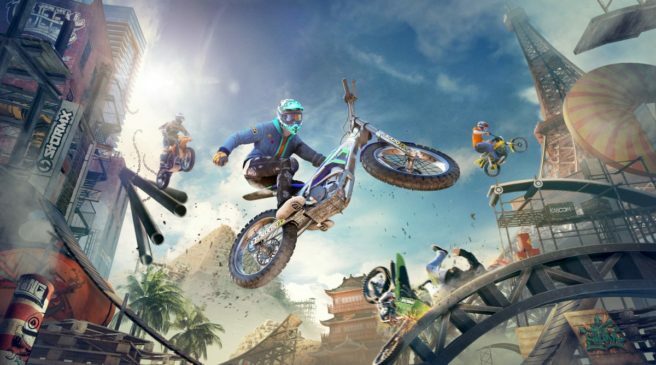 Ubisoft is planning four Seasons for Trials Rising in which riders will have access to new poses, animations and customization items for bike and rider, as well as seasonal-themed Events like Easter. There will also be Weekly Challenges, providing in-game objectives that reward players with in-game currency and limited-time prizes. Challenges will be renewed on a weekly basis.